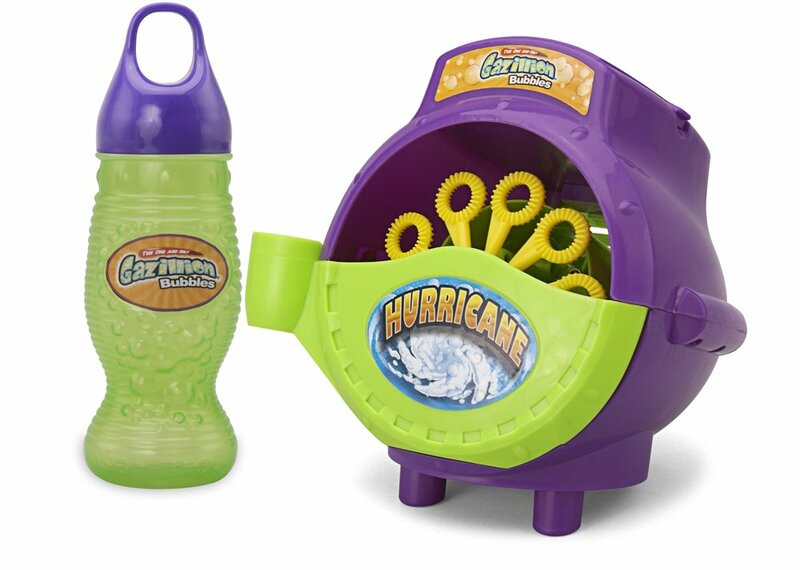 Home Kids Toys & Games Archive by category "Fun Outdoor Toys"
The weather is warm & you want to keep the kids outside & running in circles as long as possible! There are literally hundreds of kids picnic tables on the market…but you are only going to see the top 4 here. I’m all about quality! 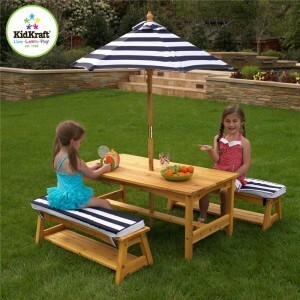 I have this one & can assure you the quality of this kids picnic table is as good as my adult set. 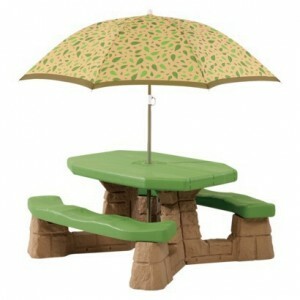 It comes with an umbrella which is a huge deal for us & padded cushions for the seats. 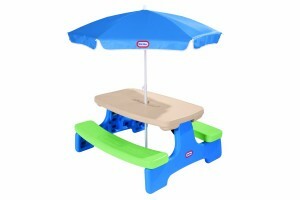 The seats aren’t attached to the table & it makes things easier for littles to get on the benches. This one is ideal for kids 7-ish and under because it’s literally pint-sized. However I have sat at the table…I just feel like a giant! It’s very sturdy & after 2 years & 5 boys worth of use it still looks brand new (some kind of miracle!). You’re looking at a 30-45 minutes assembly depending on how handy you are. The directions are great & easy to follow. My daycare has this one & it’s pretty roomy…you can fit 6 little butts on those benches! This one is a little more simple, it features an umbrella & plastic all connected together type design. 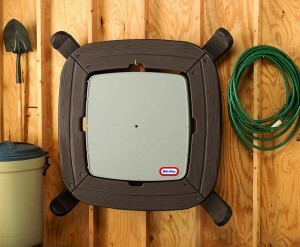 Because of the material it’s super easy to clean & will work inside or out. Once assembled it measures 20 1/2″H x 43″W x 41″D. If you do lots of outdoor crafts or your kids are into making mud pies this is the table for you. A hose & scrub brush will remove just about any filth your kids can create. The directions are easy to follow & assembly on this table is super fast. Ok, so you can’t ever go wrong with Little Tikes, their stuff always fades out & the kids are off to prom way before it breaks! This one has some cool features. it folds flat to store…that’s right you can fold this thing up for a road trip or to hide in the closet during winter. 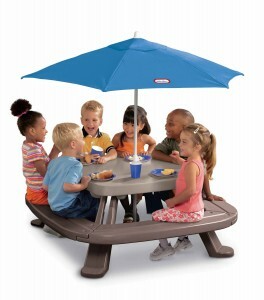 It seats up to 6 little people at a time & of course has a swanky removable umbrella. The table top has 2 cup holders & a fabulous condiment/crayon tray. Age range on this picnic table is 2-8 years old. According to my friend the umbrella that comes with it is amazing & stand up to real storms…plus keeps the sun off her kids while they eat. Also Little Tikes makes a smaller Jr size…that table is really small & your kid will outgrow it very fast…so skip that one & go straight to the toddler/small kid version shown. If your kids are social butterflies and have a gaggle of tiny friends this is the table for you! This kids picnic tables seats 6-8 littles at a time, making it perfect for large families or visiting relatives. It comes with a large umbrella & when not in use this cool picnic table just folds flay & can be hung on the wall or stuffed into a closet. It also makes a trip to the beach super easy! It’s made by Little Tikes so you know it will last for years of hard abuse by the kids. Once assembled you won’t need any tools to fold it flat. Directions are pretty straight forward but plan on at least an hour to assemble. This simple toy is perfect for kids ages 8 and up. 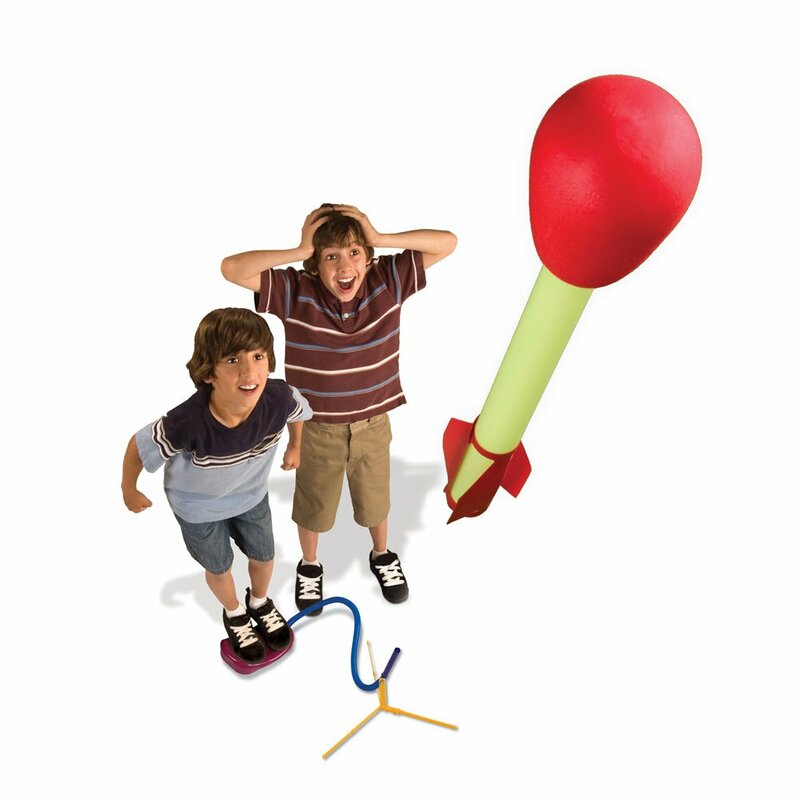 It comes with 4 rockets & they shoot 200 feet in the air…so you know how much a kid would love this! Kds Ultra Stomp RocketBuy It! 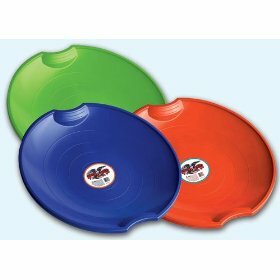 3-pack of 26″ Flexible Flyer Plastic Saucer 26″ Diameter. 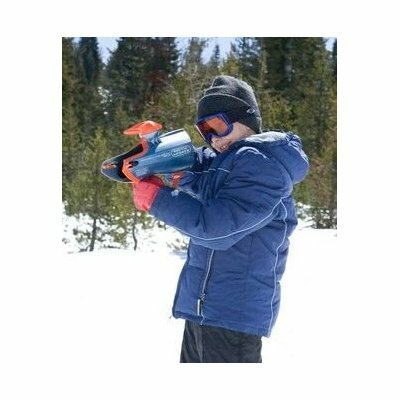 The kids will have hours of fun in the snow! These saucer come in three great colors. This simple tool does what it is intended to do: make snowballs to the right compactness. The snowballs were neither too soft that disintegrate when thrown; nor were the snowballs packed too tightly making dangerous iceballs. From toddlers to grownups, the tool is very easy to use. Plus, its bright red color makes it very easy to find in the snow. 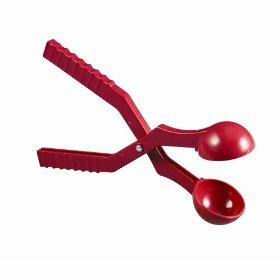 I would recommend getting one for each child/snowball maker; it’s hard to call a “truce” in the middle of a snowball fight to borrow the snowball maker! Ready to make billions of bubbles? It’s easy with the Gazillion Bubble Machine. Fill it up, flip the switch and watch as gazillion amounts of bubbles continuously blow from the Bubble Machine….then watch kids go nuts.